Think you’ve seen all the cute braided hairstyle ideas for girls? You haven’t! Not until you check this trendy new batch! It’s incredible how many new ideas are flooding in right now. So feast your eyes on these super-cute braided hairstyle ideas for girls and your fingers will soon be itching to braid! 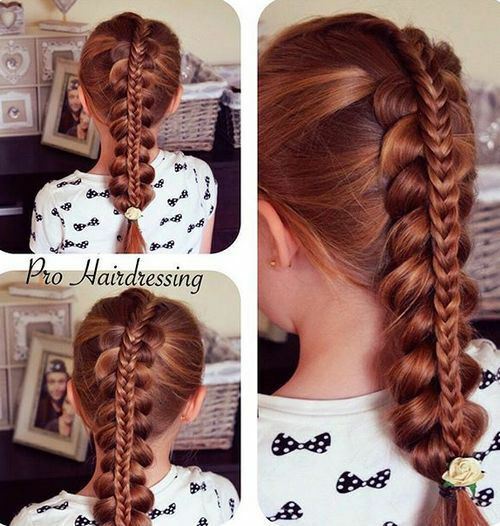 Perfect for a special occasion, this cute braided hairstyle for girls brings together three popular hair fashions to create a very new look! 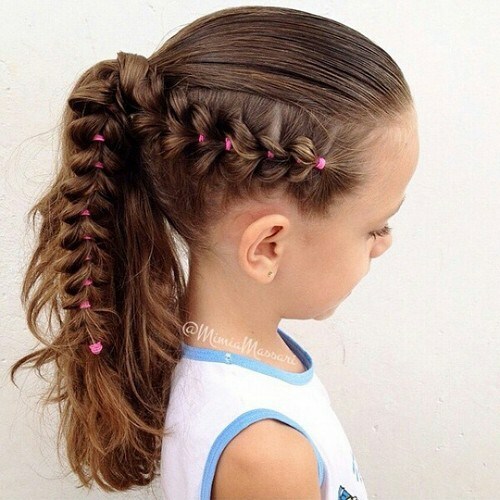 Depending on the thickness of the hair, you can make the head-band braid from the first section of hair, or just add a faux-braid for speed and convenience.The parting is made across the head from just behind each ear and it’s easy to make five little pony-tails behind the braid. Add a touch of sophistication with loose waves in defined strands – like this lucky little girl! Braids are never out of fashion for girls and this beautiful copper hair is enhanced by contrasting plaits in a fabulously fresh braided hairstyle. 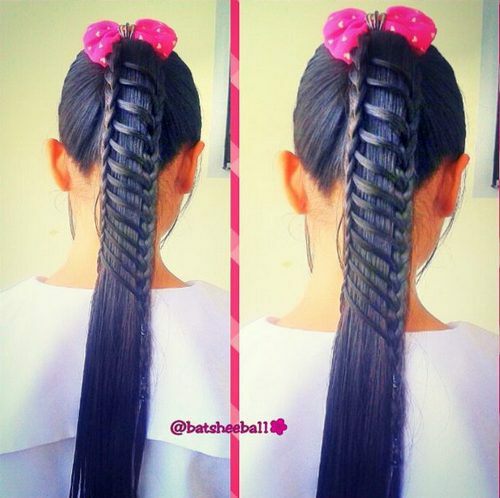 This is another style that looks very professionally finished, but you can easily do it at home for your daughter. 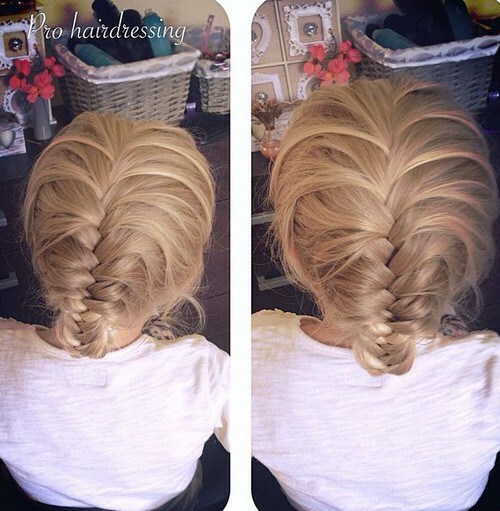 The lower braid is loosely plaited and gently pulled out, giving lots of extra volume. The higher herring-bone braid makes a lovely contrast. Suitable for any occasion. This brightly accessorized broad braid hairstyle opens up a world of new options for long hair! Great for keeping hair under control during the summer and at the beach, when it can get pretty windy. It’s also a very sophisticated braided hairstyle, that’s great for a formal event, maybe with a patterned silk scarf in the lower 6 inches, a black ribbon with light blonde hair or a colour that complements a pretty gown! 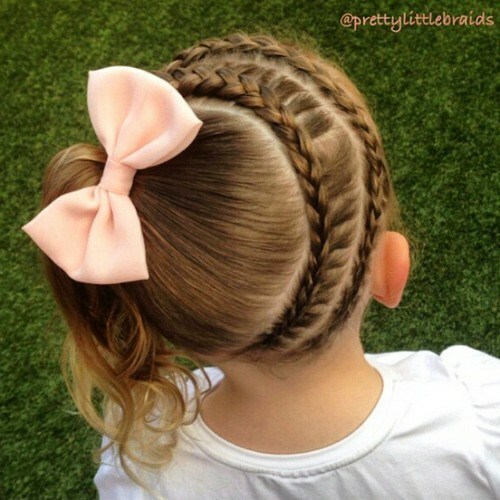 There seems to be no end to the variety of cute braided hairstyles for girls! 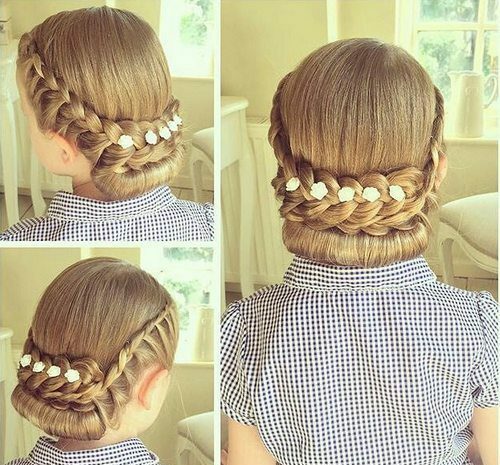 This voluminous upstyle creates a large ‘bun’ shape at the back of the head, outlined by a very cleverly woven plaited border. 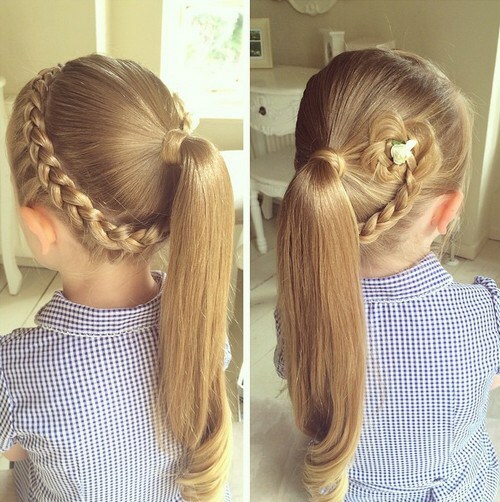 Constructed from a pony-tail in the middle of the head at the back, means this will be a comfortable and practical braided upstyle suitable for every activity your little girl may choose during her busy day! We love the flower accessory on this asymmetrical half-up, half-down braided hairstyle! Two sections from above the forehead are arranged in a new way to add interest at the front, before becoming decorative, twisted braiding. 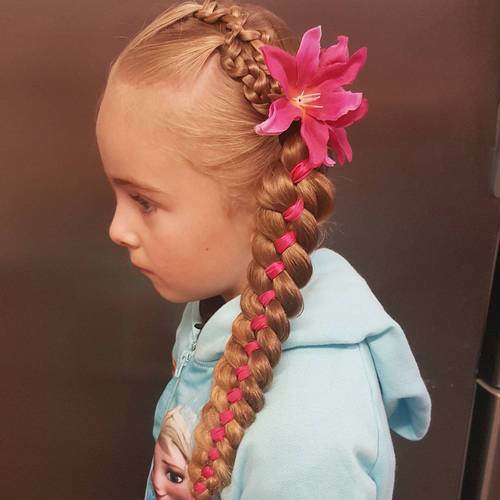 The fabulous ‘hot pink’ flower colour continues in the ribbon woven into this cutie’s long plait, draped over one shoulder. Is this young model getting ready to be a brides-maid later in the day? Wherever she goes, she’s sure to steal the show with this pretty braided hairstyle! This elegant look shows off very long hair with a swishy pony-tail in a cute, feminine look that’s suitable for girls of any age. Hair from the front section of the ‘ear to ear’ parting is braided in an asymmetrical shape forming a graceful loop down to just above one ear. Inspired by the ‘rambling rose’ plant, the braid then sweeps upwards to a ‘big finish’ in the carefully arranged ‘rose’ at the back. A very pretty look that’s perfect for girls with long, straight and thick hair. I’ll bet this little cutie is as proud as punch of her freshly-done hairstyle! 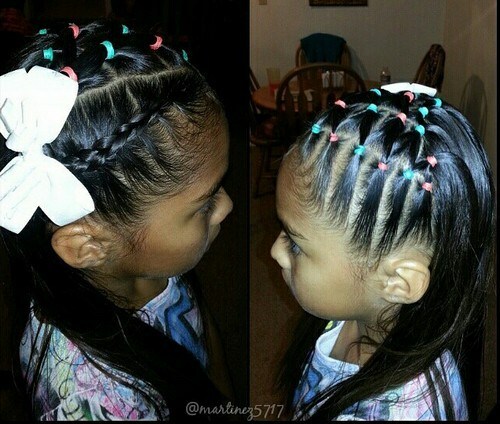 It’s a new type of asymmetrical braided hairstyle for girls, with sections kept in place by green and pink elastics on one side at the front. Below the deep side parting on the other side, is a sleek, black French braid beautifully complimented by a pristine, white bow. There’s really nothing as sweet as a little girl wearing a ribbon bow in her hair, is there? With the rest of the hair arranged in straight sections draped over her shoulders, this is a beautifully-judged hair design! Vintage hairstyle ideas from the 1940’s inspire this updated chignon with beautiful braided details and flowerbuds. This is a sophisticated braided hairstyle for girls, which would be perfect for a bridesmaid at a formal wedding. From a front parting, the sides are decorated with twisted-strand, in-braiding. Notice how the lighter hair, from the tips, shows up prettily against the smooth hair around the head. At the nape, the hair is expertly rolled under and the flattened braid above completes this graceful, ‘high-society’ look! 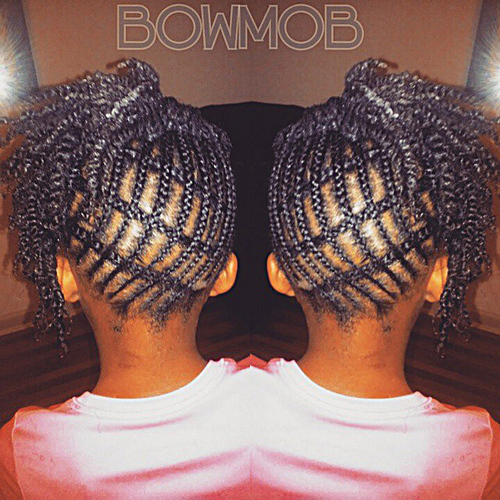 Braid for black girls – This stunning braided hairstyle for girls takes traditional corn-row lines to create a modern, criss-cross pattern around the sides and back of the head. From the crown, there’s an exhuberant asymmetrical pony-tail with graduated lengths, cascading up and outwards, to add contrasting volume and shape. The high pony-tail can be made with bantu twists or twisted braiding and gives a trendy, ‘dreadlock’ look, that teens love for its ‘rebel’ style! 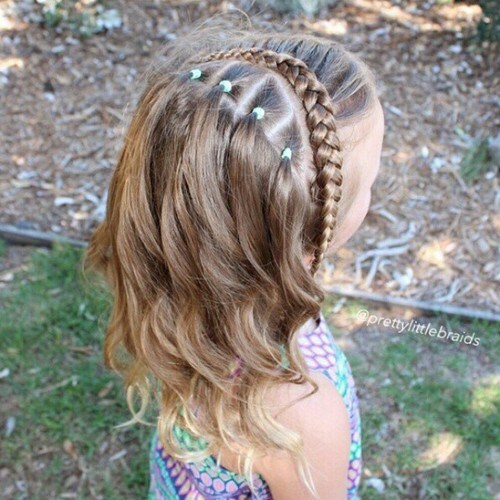 Here’s another of our favorite, cute braided hairstyles for girls. We love that it’s strikingly different and asymmetrical. But not too complicated to do at high-speed – just before the school bus arrives! Starting from the nape, the first head braid forms a pretty border around the forehead, keeping it cool in hot weather or gym class! The second head braid is made in a parallel line that’s very pleasing to the eye. 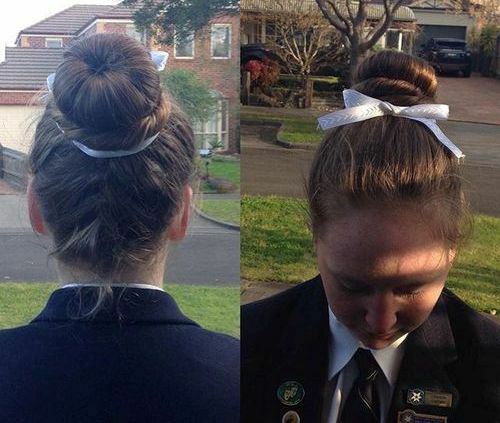 And the rest of the hair is swept up to form an asymmetrical pony-tail, decorated with a pretty bow – also fastened in a different way – vertically placed, instead of ‘straight across’. This is an updated verson of the classic, long, straight pony-tail fastened just behind the crown. And it’s amazing what a difference the braided strands make to a simple style! In the past, women often controlled their long hair with a ‘snood’ – a sort of large-gauge net enclosing loose hair at the nape of the neck. That may be the original inspiration for this stunning and different Boho look your girl will love! Who can resist the fun of wearing a hot pink, ‘look-at-me’ bow on the top – totally irresistable! Older girls want to look chic like their favorite style icons. This simple (but still cute) braided hairstyle strikes the perfect balance for a teen who has outgrown pretty bows and craves a more mature look. The model has dark-blonde hair, highlighted with a strawberry-blonde shade, a flat, wheaty blonde and a light gold – creating a fabulous palette of reflected light around the head. So – with the colours making their own fashion statement – this loose, asymmetric side-braid and casually tied pony-tail is the perfect ‘Too cool to care‘ teen look! 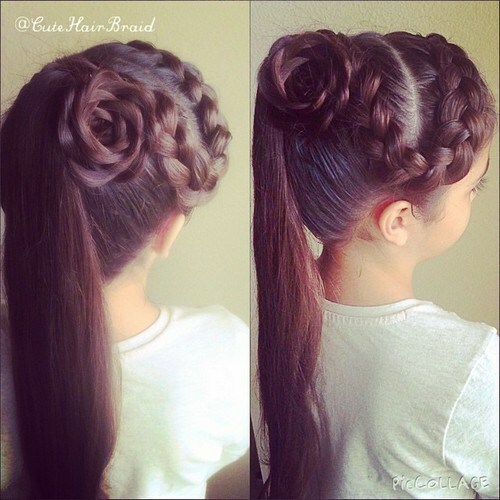 This braided hairstyle shows off the naturally varied shades in any head of hair. It’s a semi-formal style, with a trendy casual finish that allows wispy strands to break the formality. Extra volume is achieved by spraying hair with dry-shampoo and back-combing/teasing the hair at the roots, for a bouffant, braided hairstyle. It’s an artistic upstyle with tresses arranged to make soft curves towards the middle of the head, and strands plaited to make an inside-out braid texture. The smoothed-back from the forehead look, with a pony-tail at the crown, is a trendy look for boys and girls this year. However, this version has very decorative flat braiding at the sides highlighted by cute pink elastics. A strand of hair covers the pony-tail fastener and the braid hanging alongside the ruffled pony-tail creates a feminine and sophisticated look. This braided hairstyle is perfect for long, straight hair! 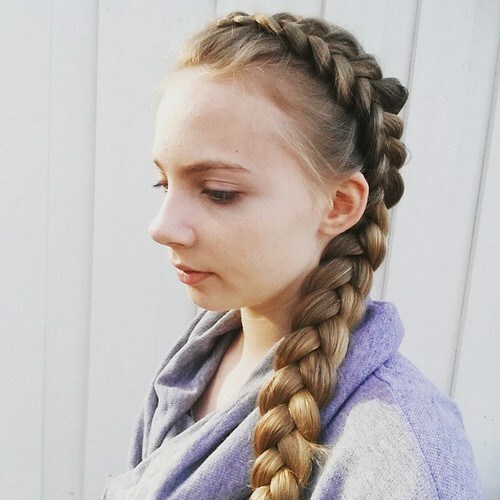 This is an alternative view of the double-braided hairstyle shown from the back above. The braiding begins at the nape of the neck and creates two 4-strand head-bands curving around the head. The forehead is left bare to show off a nicely rounded brow and the rest of the hair hangs loosely at the back. 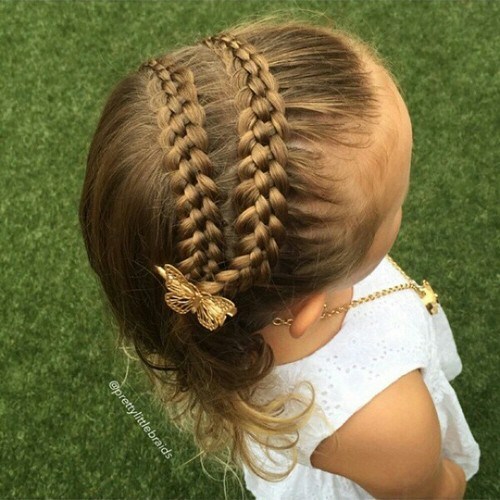 But it’s the pretty butterfly hair-clip that sets 0ff this cute braided hairstyle to perfection! The shops are full of pretty hair accessories these days, so if you can’t find a butterfly, use a flower or an animal brooch instead. Thick hair can be heavy for a young head, but this ‘up and down’ braided hairstyle distributes the weight in a comfy and attractive new style. The front section is caught-up, off the face in a pretty head braid. The feature braid adds charming asymmetry, starting above the ear on one side and ending in a beautiful swirl at the back, topped off by a dainty flower accessory. The rest of the hair is fastened in a simple pony-tail, fixed in a comfortable position half-way down the head, with a loose curl to decorate the tips! Find more latest right hairstyles on hairstylesweekly.com. 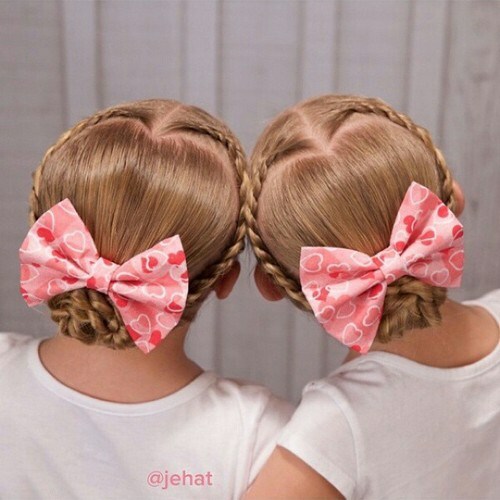 What’s cuter than this heart-shaped novelty braided hairstyle? It’s perfect for Valentine’s Day, but also a great look for any other day of the year! Love-hearts are never out of fashion and this look suits girls of any age. From a centre-parting, the hair is divided and plaited into two long, slender braids. The back section is brushed smooth and plaited into more braids. The head braids are lightly pinned to create a curved heart shape and the back is fashioned into a lovely, braided chignon at the nape. Here’s another braided hairstyle that’s very popular with teens – the asymmetric side-braid. It’s trendy enough for school or college, but also quite neat, giving the impression of an organised young woman who has everything under control! Hair of this thickness needs firm control to show off its enviable properties and the regal crown braid, along with the side-braid, creates an attractive showcase for the natural highlights in all long hair! The high bun was originally a formal upstyle, signalling the end of girlhood’s loose hairstyles, worn by young women to show they were old enough to marry, This modern-day version has light up-braiding at the back, adding texture and interest leading up to the bun. 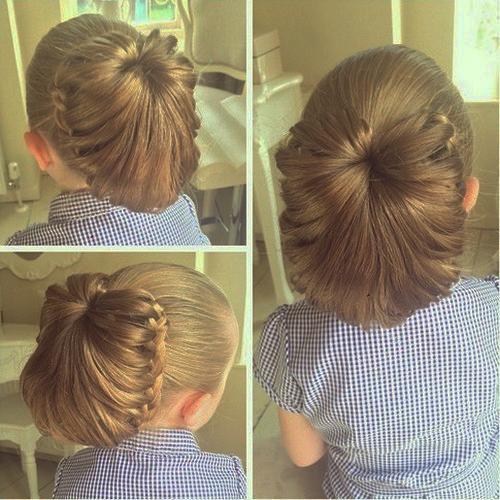 This is a ‘double-bun’ with a twisted circle of hair as the ‘base’ bun, and a traditional ‘dough-nut’ bun set cheekily on top! The ribbon adds a touch of individuality to a pretty, schoolgirl braided hairstyle. So – what d’ya think? Are you feeling inspired by my selection of super-cute braided hairstyles? I hope I’ve helped keep your favorite girls totally on-trend and beautifully braided – with a fresh look for every occasion! Just flash these photos and stand back as they bounce around the room with excitement!